Use of the EPO hormone to boost athletic performance did nothing for amateur cyclists in a road-race trial, according to a study Friday that questioned whether blood doping is worth the risk. 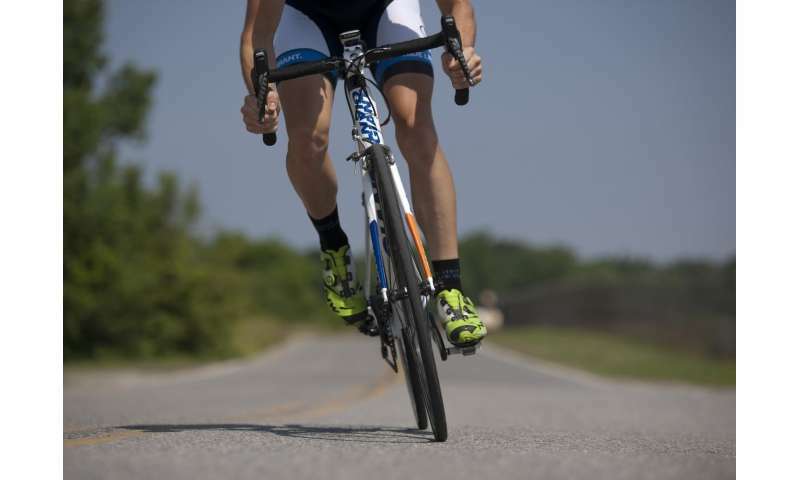 While they gained a bit of power on stationary bikes in lab tests, cyclists given erythropoietin (EPO) did not perform better in a real race than peers given a dummy-dose, Dutch researchers said on the eve of the annual Tour de France cycling race. Any effect of EPO was "undetectable in a real-life cycling race," the team concluded in the journal The Lancet Haematology. "Claims of great effects in popular literature cannot be substantiated, and therefore these results might reduce the incentive for athletes to use" EPO doping. EPO is a hormone naturally produced by the human body to stimulate production of red blood cells which carry oxygen to the muscles. Injecting EPO is a form of "blood doping" popular among bikers and runners, but thickens the blood and heightens the risk of heart disease, stroke and blood clots. EPO doping has been banned since the 1990s, but is thought to be widely use among professional athletes. Disgraced cyclist Lance Armstrong admitted to taking it. The authors of the new study could not use professional cyclists in their trial, as this could have exposed the athletes to a ban for using a prohibited substance. Instead, they enrolled 48 well-trained but non-professional male cyclists aged 18 to 50. Over eight weeks, half were given weekly shots of rHuEPO—a synthetic drug form of the hormone—and the other half a placebo salt-water solution. The participants did not know who got which. Doses were similar to those used by professional cyclists, the researchers said. They put the group through a series of performance tests—two in the lab on exercise bikes, the third on the road 12 days after the last dose. Red blood cell concentrations and performance—including power output and oxygen consumption—were higher in the rHuEPO recipients than the placebo group in the high-intensity lab test, they found. But these differences largely disappeared in the lab-based test of endurance. On the road, a 21.5-kilometre (13.4-mile) race up Mont Ventoux—known as the hardest of the Tour de France climbs—power output, oxygen consumption and race time did not differ between the doped and placebo cyclists. No negative health effects were reported during the trial, though the rHuEPO group had higher levels of blood molecules that may boost the risk of thrombosis, said the research team. Now, "the question remains whether our data can be applied to professional cyclists." Commenting on the study, EPO expert Michel Audran of France's AFLD anti-doping agency, said the result may be explained by the absence of a placebo effect. This happens when a patient given a dummy drug in an experimental trial starts feeling better because they believe the treatment to be the real thing. A 2012 study, Audran pointed out, had shown that 3,000-metre runners improved their performance by as much as six percent after knowingly taking EPO. This may, at least partly, have been the result of mind-over-matter, whereas in the new study participants did not know whether they had received a booster. "The placebo effect can play a role, I have seen it myself in trials," Audran told AFP.